I baked some coconut butter rolls yesterday, and they were heavenly yummy. The steps of making these coconut rolls are very similar to those of making cinnamon rolls. The only difference is the filling. Instead of cinnamon and brown sugar, the buttery taste coconut filling is rolled inside. 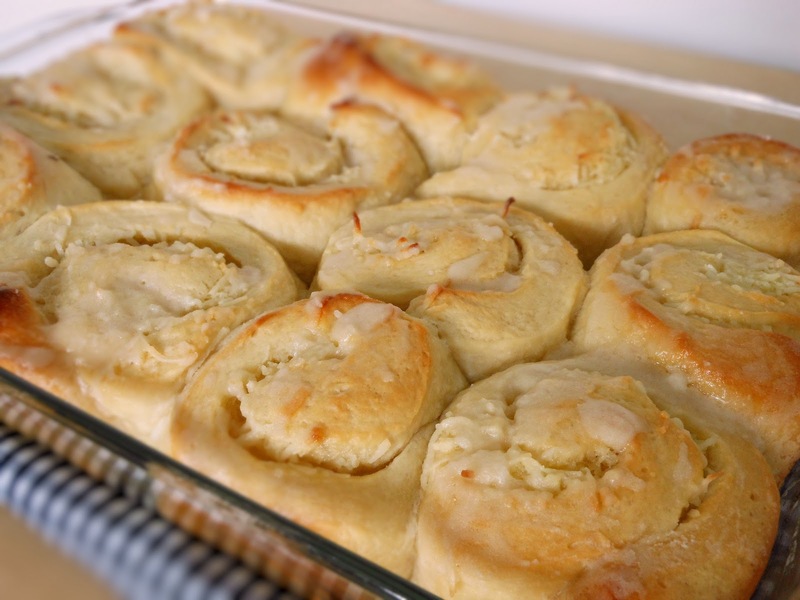 If you love sweet rolls or buns, these coconut butter rolls will sure make you mouth watering. Beat egg, butter, sugar, and flour together until creamy. Add shredded coconut to the mixture and mix together. Mix 1/4 cup butter, 1 cup icing sugar and 1/2 teaspoon vanilla extract together. Mix 1 teaspoon of sugar with 1/2 cup of lukewarm water. Add yeast to the water and stir to dissolve. Let stand for 5 minutes or until foamy. In a bowl of a stand mixer, using a flat paddle attachment to beat butter or shortening until creamy. Add egg, sugar, milk, and salt to the butter or shortening and continue beating at medium speed until smooth. Add yeast to the mixture, mix slightly. Switch to a dough hook. Add 1/2 cup of flour at a time to the mixture and mix it at low speed until 3 cups of flour are finished. Turn up the speed to medium and knead for about 8 to 10 minutes or until the dough is nicely formed. Place the dough in a floured bowl. Sprinkle a little bit of flour over the top of the dough if it is still sticky. Knead the dough slightly by hands until it's smooth. Gather the dough and sprinkle some flour over the top again. Cover with plastic wraps. Let rise until the dough has doubled in size. Punch dough down and knead slightly. Roll the dough out on a floured surface to approx 14" X 9". Spread the coconut filling evenly over the surface of the dough. Gently roll up the dough and cut into 12 pieces. Place them in a greased 9"X 13"X 1 3/4" baking pan. Cover with plastic wrap and let rise to double in size.